It's no secret that I do not like Cox Communications. I am not a fan of monopolies in any industry (don't get me started about text message "packages" and voice plans by cell phone companies), and I hate how Cox can get away with anything because they are the only cable broadband provider in the area. When I moved accounts with them they screwed up my online access pretty bad and had horrible error handling on their site. 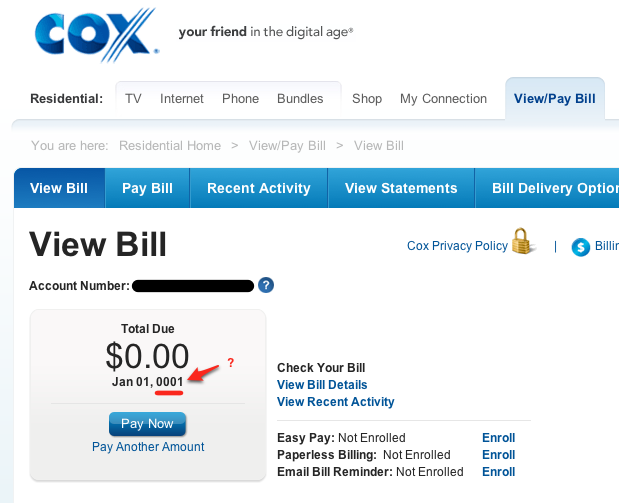 But after the dust was settled and I could log in and view my bill, I was happy to see that my bill was in fact due 2011 years ago (also, this screenshot was taken in November, it wasn't even January). Clearly a billing date was missing somewhere and the UI just rendered what it could (perhaps their DB default for billing date is 01-01-0001 if they have no bills on record). 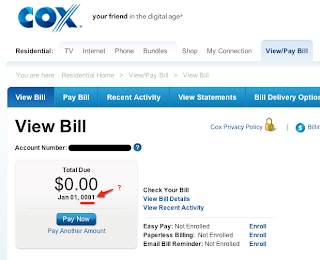 I wonder if Cox uses MySQL and has NO_ZERO_DATE set (gets set when in traditional mode).. otherwise why not use 0000-00-00 or null for the default, unset billing date? While this isn't a great example... I find it interesting that the errors and data validation bugs that show up on sites can sometimes shed light into the technologies or development practices that are used by said company. And often it's not pretty.